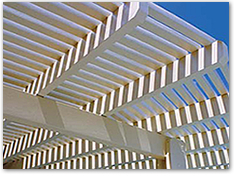 Our aluminum slat roof shade structures add beauty and value to your home. The aluminum lattices (slats) are factory painted and wood grain embossed to give your new arbor the look and charm of an old world wood arbor with out the maintenance headaches of a wood arbor. 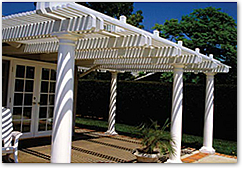 Your new arbor - pergola will be a great investment in improving your home's value and outdoor living environment. Choose from one of our stock size arbors or we can customize a kit for your specific needs. To customize you might space the slats or rafters closer together, double them up, change the post design, angle the roof, curve a section, combine a patio roof with an arbor, do off setting roofs, let your imagination go and we will try to figure a way for you to do whatever you have in mind. E-mail us, fax us or call us we are waiting to price out a structure to make your home the envy of the neighbor hood. NOTE: All our cover kits can be cut down (by you on site) as needed to reduce the width or length or height. FREE STANDING You can choose from one of our stock size arbors or we can customize a kit for your specific needs. You might space the slats or rafters closer together, double them up, change the post design, angle the roof, curve a section, combine a patio roof with an arbor, do off setting roofs, let your imagination go and we will try to figure a way for you to do what ever you have in mind. E-mail us, fax us or call us we are waiting to price out a structure to make your home the envy of the neighbor hood. Roof Only Kits for use with post purchased locally to achieve a particular look. Suggestions might be stone columns, conic columns, square columns, tapered columns, larger post; ormaybe something your designer comes up with. Try doing a online search for poly-cast columns. Roof only Arbor Kits includes: 3â€� x 8â€� support beam, beam brackets, 2 â€œ x 6â€� rafters, 1.5â€� x 1.5â€� slats, caps, hardware kit, and touch up paint. Our aluminum slat roof shade structures add beauty and value to your home. The aluminum lattices (slats) are factory painted and wood grain embossed to give your new arbor the look and charm of an old world wood arbor without the maintenance headache of wood arbors. 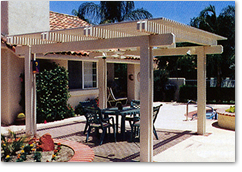 Your new arbor - pergola will be a great investment in improving your homes outdoor living areas. 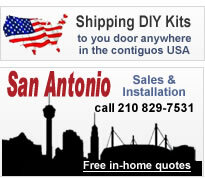 You can choose from one of our stock size arbors or we can customize a kit for your specific needs. You might space the slats or rafters closer together, double them up, change the post design, angle the roof, curve a section, combine a patio roof with an arbor, do off setting roofs, let your imagination go and we will try to figure a way for you to do what ever you have in mind. E-mail us, fax us or call us we are waiting to price out a structure to make your home the envy of the neighbor hood.